This elegant cocktail table is the perfect statement piece for your chic living room. 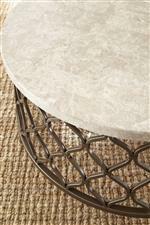 The table features a white stone top that exudes luxury. A brass base with an hourglass fretwork motif adds feminine appeal, while keep the look open and airy. The Roland Stone Top Cocktail Table by Steve Silver at Walker's Furniture in the Spokane, Kennewick, Tri-Cities, Wenatchee, Coeur D’Alene, Yakima, Walla Walla, Umatilla, Moses Lake area. Product availability may vary. Contact us for the most current availability on this product. RL100CB Cocktail Table Base 1 0" 0" 0"
Case Construction White stone tops with metal bases. Showcase transitional style with the Roland collection of occasional tables. White stone table tops exude modern luxury, while the brass metal hourglass fretwork bases add geometric interest. The result is subtly feminine and distinctly stylish, for a look that suits a variety of design aesthetics. The Roland collection is a great option if you are looking for Transitional furniture in the Spokane, Kennewick, Tri-Cities, Wenatchee, Coeur D’Alene, Yakima, Walla Walla, Umatilla, Moses Lake area. Browse other items in the Roland collection from Walker's Furniture in the Spokane, Kennewick, Tri-Cities, Wenatchee, Coeur D’Alene, Yakima, Walla Walla, Umatilla, Moses Lake area.